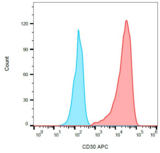 CD30 antibody LS-C46233 is an APC-conjugated mouse monoclonal antibody to human CD30. Validated for Flow and IHC. Allophycocyanin. 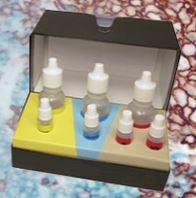 Also available Unconjugated or conjugated with FITC, PE. 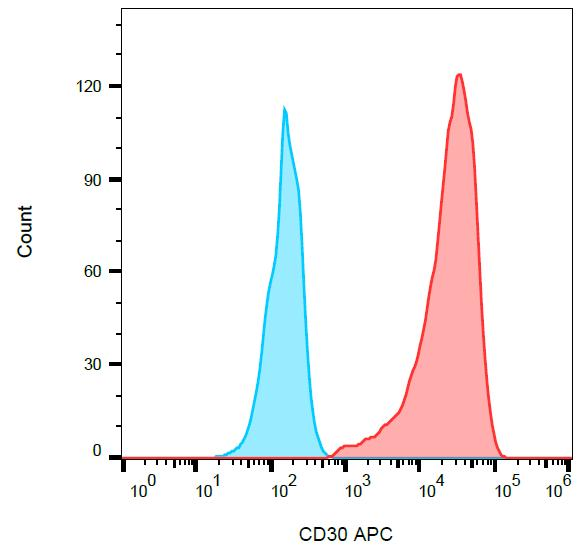 The antibody MEM-268 recognizes extracellular part of CD30 (Ki-1 antigen), a 105 kDa single chain glycoprotein expressed on Hodgkin's and Reed-Sternberg cells; it is also found in Burkitt's lymphomas, virus-infected T and B lymphocytes, and on normal B and T lymphocytes after activation (T lymphocytes that produce Th2-type cytokines and on CD4+/CD8+ T lymphocytes that co-express CD45RO and the IL4 receptor). Surface staining of K562 cells with anti-human CD30 (MEM-268) APC.